How to Remove your Number From True Caller ? If you are Smart Phone user then you must have experience with this amazing app TRUE CALLER. True Caller a service started in 2009 in Stockholm, Sweden as a Telephone Directory has become the most popular Telephone Directory. Truecaller is available on the web and as an app for the iPhone, Android, Blackberry, Symbian (s40/s60), and Windows Phones. But if you want to keep your privacy you can remove your number from Truecaller. Before this service, there was no way to find or trace phone number directly without any much efforts. But after this service, a single app on your Smart Phone can tell you the details of a unknown number. It’s amazing service with a great database of millions of users. If you want to know How its work read our article How TrueCaller works ? But sometimes you need to keep your privacy and protect your number from wrong hands. So today ill tell you How to Remove your Number From True Caller ? Read also: How TrueCaller works ? How to unlist your number from True Caller ? Its very easy to Remove your Number From True Caller. To Remove your Number From True Caller or to unlist your number from True Caller follow these steps. Chose your Country from the Drop Down list. 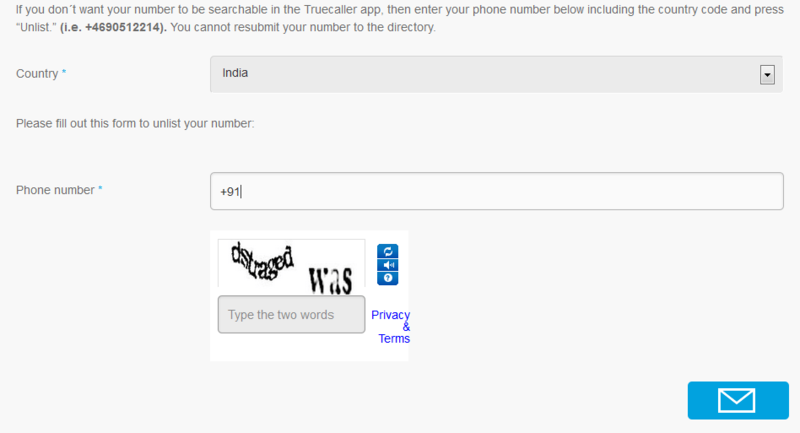 Step 3: Then It will ask you to Enter Your Phone Number that you want to unlist or remove from TrueCaller. Fill out this form to unlist your number and then click on the message icon. And your number is unlisted or removed from True Caller permanently. You can easily unlist or remove your phone number from True Caller for this read : How to Remove your Number From True Caller ? Must Read: How to add or edit your phone number on True Caller ?